The main organ of Saint Mark’s Cathedral was an extraordinary accomplishment when it was installed in 1965. 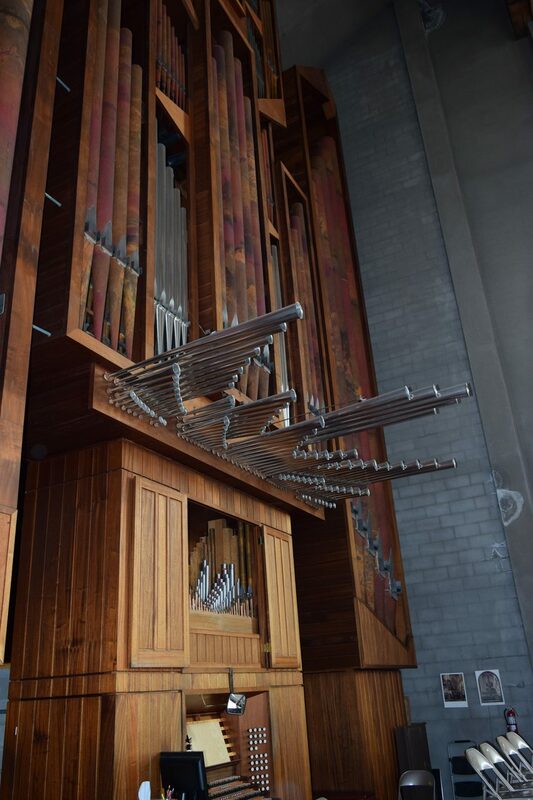 Designed and built by the Dutch firm of D. A. Flentrop, the organ now contains 3,944 pipes, ranging in size from 32 feet to less than one inch. The pipes are made of either a tin and lead alloy, cured copper, African and/or Brazilian mahogany. The organist may select from 58 speaking stops distributed over four manuals and pedal. 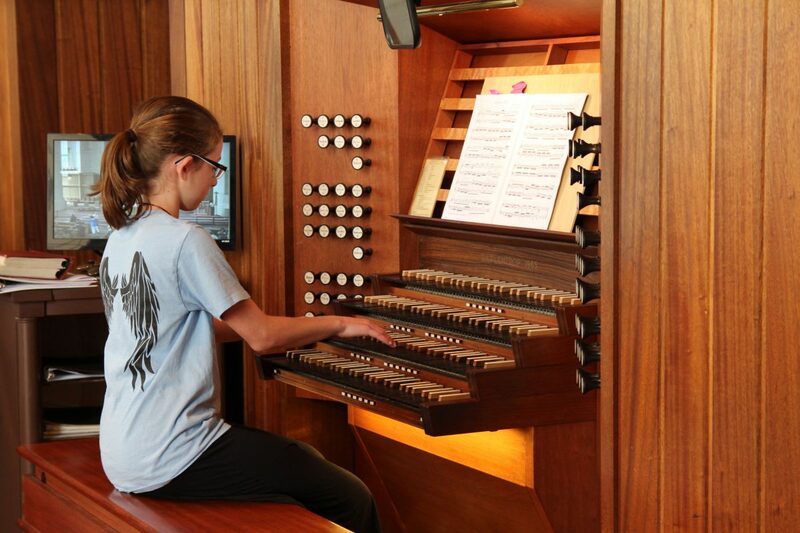 While not the first, Saint Mark’s Flentrop is one of the largest 20th century organs employing mechanical key action, and its success has influenced organ building throughout the United States and remains a landmark instrument of international note. A major restoration of the organ was completed by Paul Fritts Organ Builders of Tacoma, WA in 1993-1994 and in 2001 further work was done following damage sustained by the Nisqually earthquake including substantial seismic reinforcements. Although modern in style, the African mahogany case is structured like that of an 18th century organ, each division of the organ having its own section, complete with pipes and windchest. Each keyboard (including the pedalboard) plays a different division. The Pedaal division is split on either side of the main case and contains the longest pipes. The first (lowest) manual plays the Rugwerk (literally "back work") whose pipes sit at the organist's back on the edge of the gallery railing. The second manual plays the Hoofdwerk in the center of the main case. This division includes the horizontally mounted Trompets, similar in style to those found on Spanish organs of the 17th century. The Bovenwerk is at the top of the case equipped with swell shades behind the Prestant facade pipes and is played by the third manual. Located inside of closable doors below the horizontal Trompets is the smallest and most intimate division of the organ, the Borstwerk, playable from manual four. In 1991, thanks to a generous gift from Marion Oliver Garrison, funds were provided for the renovation of the Flentrop organ. A thorough cleaning and regulating of the instrument has been augmented by other work including replacement of all stop motors and providing a solid state combination action, giving the organist instant manipulation over the organ's total tonal resources. Likewise, the key action has been completely renewed with a "suspended" action that provides for a lighter, more responsive key mechanism. Three new tonal additions include a full-length 32-foot Bazuin (a reed stop located behind the organ case and mounted high on the rear gallery wall) which greatly enhances the bass response of the Pedaal division and new Hoofdwerk 16 and 8 foot Trompet stops installed as chorus reeds for that division's ensemble (the 16 foot reed made possible by an additional generous gift in 1995 from Roger Sherman and Arlene Tande). A mechanical addition is the Bovenwerk to Rugwerk (III + I) manual coupler to better accommodate the demands of romantic (particularly the French school) and/or contemporary repertoire. In 1996 a Zymbelstern was given in loving memory of Lawrence F. Dayball by Dr. Stephen C. Hofmann. 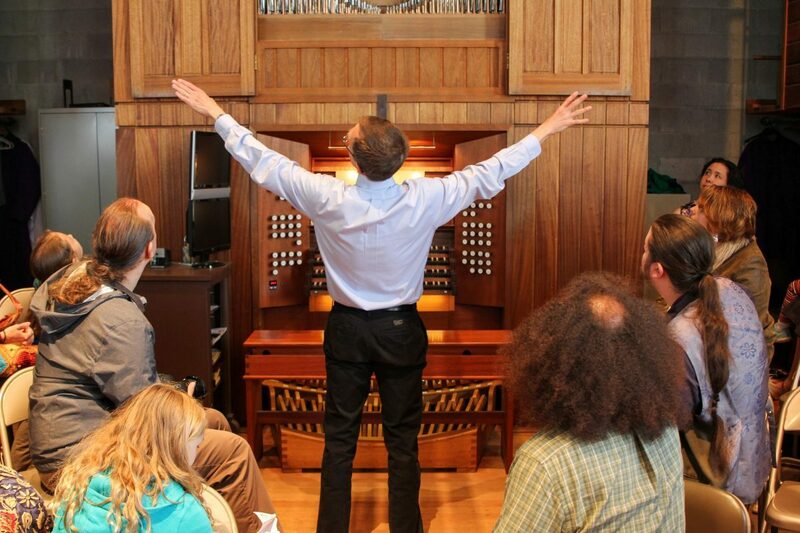 All organ renovation work has been entrusted to and carried out by the acclaimed Tacoma firm of Paul Fritts & Co. Organ Builders through Century II, a program for long range planning and completion of Saint Mark's Cathedral. In 2011, organ builder Paul Fritts & Company (builder of Thomsen Chapel’s “Marion Camp Oliver” organ and restorer/curator of the Flentrop organ for over twenty-five years) built and installed new Spanish-style trumpets (“trompetas”) which are the horizontally mounted pipes extending from the main organ case immediately above the Borstwerk division. These new pipes, a gift to St. Mark’s from Mr. Fritts, were inspired by similar horizontal trumpet pipes found in many organs built in seventeenth and eighteenth century cathedrals in Spain, Portugal, and Mexico and are specifically based upon the Trompetas found on an organ in Santanyi, Mallorca, built by Jordi Bosch in 1762 and considered to be one of the greatest organs ever built. These stops (16, 8 and 4 foot) are commanding both in appearance and sound and add a new brilliance and a penetrating power to the Flentrop organ, whether used as a solo stop (such as for soloing out hymn tunes, trumpet voluntaries, etc. ), or when added to cap the grandeur of full organ sound. Honoring the past, the original horizontal trumpet pipes installed in 1965 have been carefully packed, crated and stored in the cathedral crypt for historical preservation and archival purposes. The instrument is pitched at A-440 and is tuned in equal temperament. Finally, use of classic scaling, low wind pressure and mechanical key action permits the gentle, articulate voicing appropriate for the Cathedral's reverberant acoustics. Suspended key action and electric stop action. Note: 32 Prestant is a 12 pipe extension of the 16 Pedaal Prestant.